I admit, I’m a bit of a fan of the Oracle Database Appliance. And I also admit there are some characteristics of the X5-2 ODA’s which made it sometimes a bit hard to fit in the needs of the customer. I’ll come to that later in this post. With the introduction of the two entry-level ODA’s I wrote about in a former blogpost , the ODA X6-2S and the ODA X6-2M, Oracle has made an effort to reach out to the smaller business to fill in their needs. But will it be a succes? This blogpost is about the kind of customer-challenges the ODA (at least one of the series) could be a solution for. One of the flaws of the ODA X5-2 that caught the eye was the inability of running the Oracle Standard Edition 2 database, in combination with the rather high priced hardware. But one snag that was a bit hidden was the following. Suppose you bought an ODA X5-2 and configured this as bare metal. You’ve only got licenses to activate 12 cores for Oracle Enterprise Edition. No problem so far. The next thing what could happen is a new small project to land on this ODA, needing an Oracle Enterprise Edition with the Spatial (or other) option activated. This database only needs the capacity of 4 cores, but unfortunately you have to pay Spatial licenses for 12 cores, or at least 6 cores when installing this on 1 node. With the new entry-level ODA’s Oracle you’ve got more flexibility to overcome this kind of risks. You may install these databases with Spatial and or other options for example on 1 entry level ODA, with 4 cores enabled. It seems a little odd on the other hand to buy an extra machine just for a few databases while having another HA ODA at your disposal. But in a license-driven architecture where you are utilizing the environment it could be a solution. Software licenses and penalties are a bit more expensive than hardware at the end. I read some remarks in blogposts that it is a pity these new ODA’s has only one node at their disposal, so you can’t use RAC (One) with either Standard Edition 2 or Enterprise Edition. For some customers it’s a pity I guess. On the other hand, we are advising a lot of companies which are using Oracle, and when listening to them they don’t always need RAC or RAC One for their (High Available) applications. And when the outcome is that RAC is indeed the the solution, they don’t need it in a development- or test- environment. So in that case, you can activate the entry-level ODA’s in a cost-effective way in the development- and test- environment . The use of DataGuard with single instances as a high available solution has become more and more common good. A prerequisite of using this of course is the use of Oracle Enterprise Edition, and the use of the new entry level ODA’s are suitable for using DataGuard. I think the lack of virtualization will be the most missed option in the new ODA’s. Especially the ‘M’ model – ODA. But… it is still called a DATABASE appliance, isn’t it? Back to the original, the two node ODA. 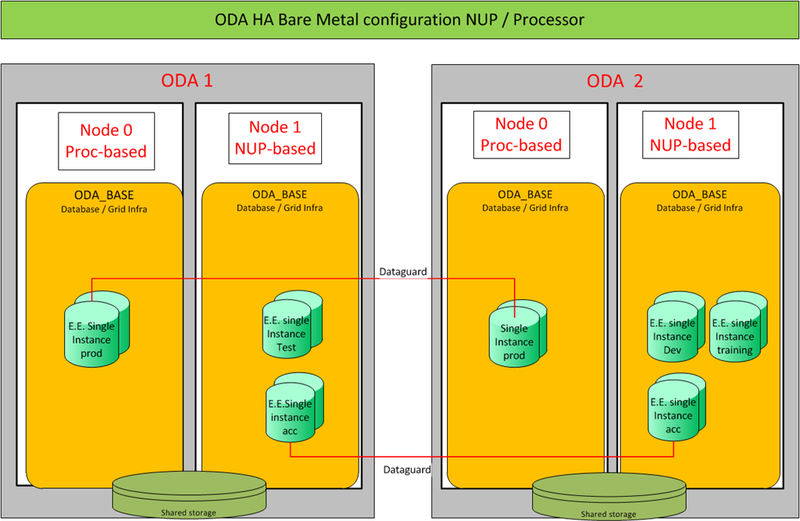 In this image there are two ODA’s, and in the ODA the nodes are licensed with different metrics. One node as processor-based, and for the other node it’s possible to run NUP-based. When using Dataguard, it’s important that the standby-site has the same license-metrics. You may design the ODA a bit complexer, e.g. de ODA in a virtualized configuration, with Weblogic installed. 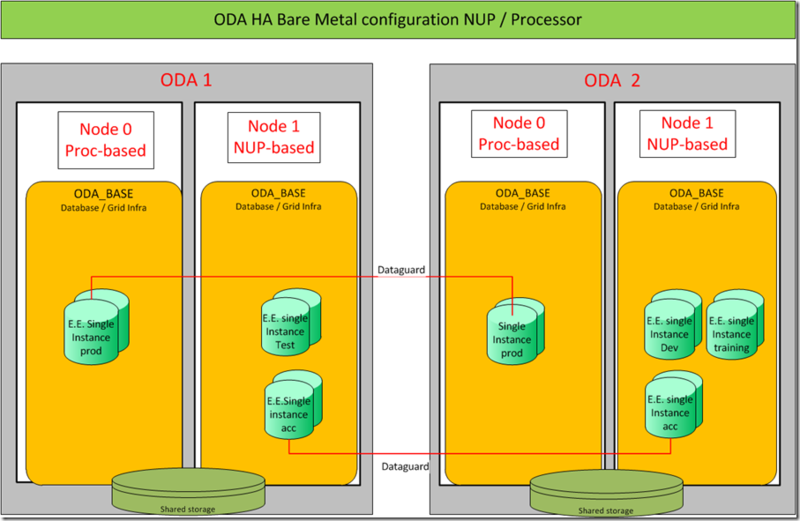 RAC on one ODA at two nodes, and standby database on one node of the other ODA. 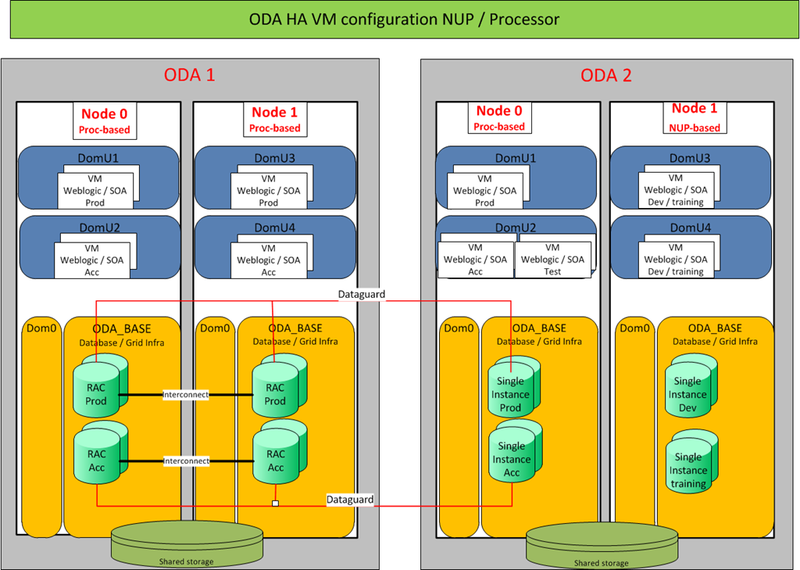 Weblogic clustering on one ODA at two nodes, and at one node on the other ODA. The last node of the second ODA is completely used for development- test- and trainings-purposes. The possibilities are quite numerous, but it all depends on the needs or drive of the customer. Yep, I’m a bit of a fan of the ODA’s, for the technical, but moreover for the possibilities to use it as a cost-effective way for a customer to run their Oracle environment. And I think these kind of small machines with extra software and capacity on demand, makes life easier and cheaper for the customer. Predicting a nice future for these machines….